IT Administrators often need to know who is currently logged on / connected to a server. With UserLock, an organization can track and record all user access to know who is logged into the Windows Server network environment, from which system(s), since what time and for how long. Once deployed, every user session on the network is monitored and audited by UserLock to provide immediate and real-time visibility on all network sessions. This includes all session types (workstation, terminal, Wi-Fi, VPN and IIS sessions). Note: This real-time visibility can easily be set up for your network with the fully functional trial download version of UserLock. Take a look now! Now you can see all sessions that are open at any moment. All session events are stored in the database for auditing. Further information about the session includes for example the last workstation on which the user logged off and time of the last logoff. You can also choose to monitor user sessions by computer. You can view all users with a session on this computer, get the computer localization (building/room of the computer etc) and view the computer name, the client IP, the organizational unit etc. Because UserLock continuously monitors all login and session events in real-time, organizations can also react to what users do through alerts. These notifications allow IT administrators to instantly react and respond, directly from the UserLock console itself (E.g. 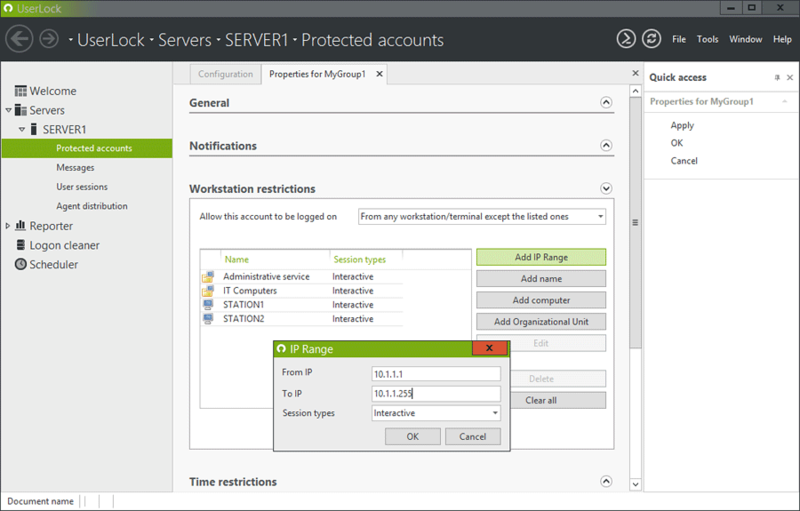 remotely closing or locking user sessions or the shutdown of specific workstations). Being able to immediately respond to suspicious or disruptive access events helps an organization reduce the risk of malicious and careless insider activity. In addition to monitoring and alerting, UserLock’s granular access restrictions can control what the authenticated user can / cannot do. This empowers IT to manage and automatically block all inappropriate or suspicious logon events. Based on multiple criteria that support an organization’s user network access policy, restrictions can be set by machine/device, location, time and number of concurrent sessions, according to user, user group or organizational unit and according to session type. Fast to deploy, UserLock is installed in minutes on a standard Windows Server. As the video tutorial shows, a wizard walks you through the installation and takes just a few minutes. There is no requirement to use a Domain Controller Server. Any Windows Server 2016 / 2012 R2 / 2012 / 2008 R2 / 2008 can be the host. UserLock can protect any machine running an operating system of Windows XP or more recent.